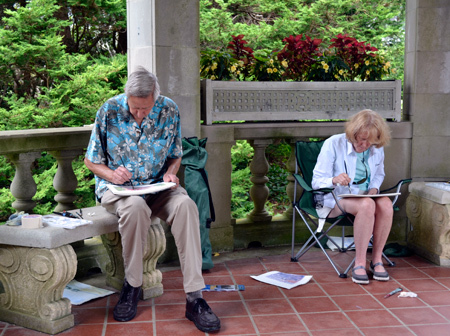 Recently I held a watercolor lesson at Harkness Park in Waterford, CT. This two day class was a private lesson for two people that were new to painting in watercolor. The first day we started out with the basics of brush handling and the variety of papers and paints available. From there we practiced a flat wash, gradated wash, variegated wash and we finished up with several different sky paintings. I like to demonstrate a variety of techniques first and then the students follow with their own painting techniques. We painted a landscape looking west from the park at the start of the second lesson. The pencil sketch below I did before I started the watercolor landscape. After completing the landscape we headed to the gardens. 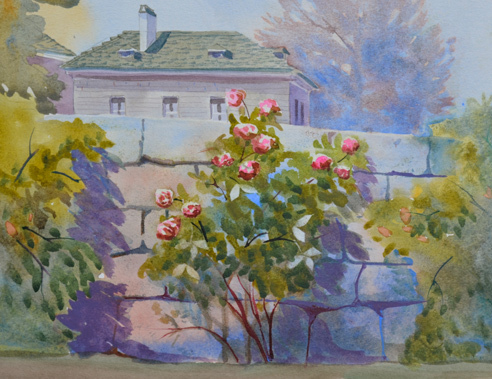 Below is the watercolor that I did of the stone walls and roses that surround the gardens at Harkness Park. Watercolor done on location at Harkness Park in Waterford Connecticut. This demonstration above shows how to paint a stone wall as one large shape wet into wet with a variety of colors and then adding the details of the stones. I painted this on location at the watercolor lesson and finished up the background area of the mansion after I returned home. The students painted along with me on their own watercolor. 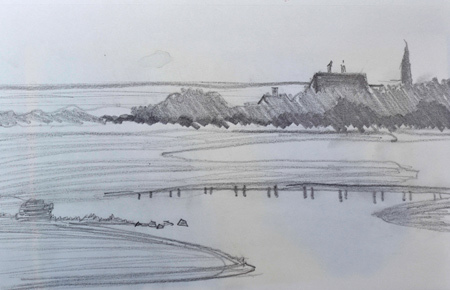 Quick pencil sketch of a landscape from Harkness Park. Here is a pencil sketch I did while sitting in a field on the morning of my lesson. Sketches like this help layout the composition for a painting. If you spend a little time with a sketch you can work out any problems before you start the actual painting. I use a soft graphite pencil and lay it on its side to fill in larger areas quickly. We went ahead and painted a watercolor of this scene looking west from Harkness Park in Waterford, CT. I gave one of the students my finished watercolor of this scene and I forgot to take a photo of it so I cannot show you my finished watercolor landscape. Example of a variegated wash in watercolor paint. 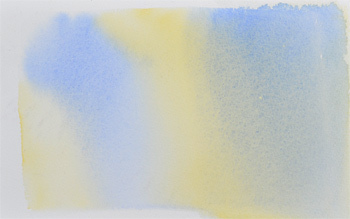 Above is a wash with two colors that we practiced on day one of the watercolor lesson. We tried a flat wash and a gradated wash before trying the wet into wet wash.
Watercolor lesson in the garden area at Harkness Park in Waterford, CT.